Engaging retellings of Biblical stories—witty, hilarious and always profound—will invite you to grapple with questions and issues that are often hidden in the original text. Short stories of daring, brave, thoughtful, wise women who played important roles in the early days of Judaism, Christianity and Islam. Invites us to understand and appreciate the struggles and triumphs of these mothers, daughters, believers and seekers. Be informed and inspired, delighted and supported, encouraged and entertained by stories and prayers on the work of the Church—from the unique perspective of clergywomen from around the United States, Canada and the United Kingdom. With insight, thoughtfulness and wit, these provocative and entertaining re-imaginings of stories from the Bible highlight the ways God can work for and through us, even today. Listen. 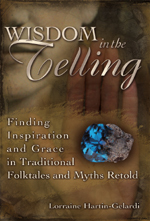 Hear your deepest longings, triumphs and trials in these ancient tales of the human experience. Drawn from many cultures and faith traditions—including Irish, Scottish, English, European, Asian, Indian and Middle Eastern—each retelling illustrates the healing and powerful connection that stretches across the globe and unites us all in an embrace of wisdom through words. You will see your own struggles and successes mirrored in the lives of the characters contained in these pages: As you travel through their stories, you will hear a gentle voice urging you to tap into your own endless power and potential.